What is ESG (Environmental, Social, and Governance)? 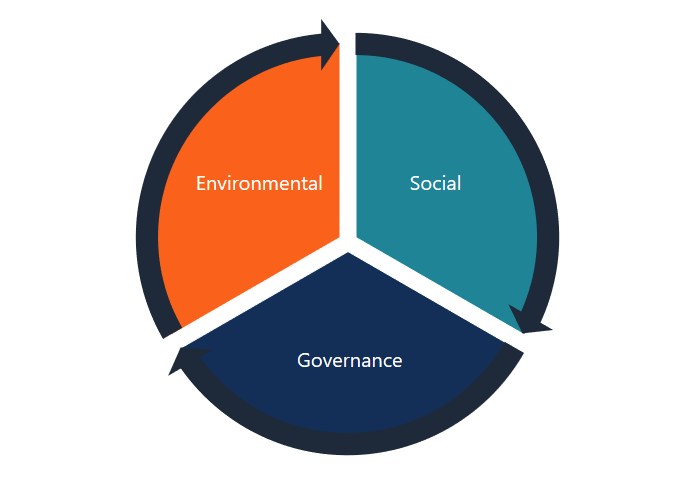 Environmental, Social, and Governance (ESG) are the criteria that altogether establish the framework for assessing the impact of the sustainability and ethical practices of a company on its financial performanceThree Financial StatementsThe three financial statements are the income statement, the balance sheet, and the statement of cash flows. These three core statements are intricately linked to each other and this guide will explain how they all fit together. By following the steps below you'll be able to connect the three statements on your own. and operations. Initially, the ESG framework was only used by impact investors to determine if they were suitable investments. Nowadays, the framework gains more recognition among all types of investors because of the greater attention of governments and regulators to such factors, and a stronger public awareness of the environmental and social influence of companies. The majority of the big publicly traded companiesPrivate vs Public CompanyThe main difference between a private vs public company is that the shares of a public company are traded on a stock exchange, while a private company's shares are not. There are several more important differences to understand publish reports about their ESG initiatives. ESG factors can significantly impact the company’s financial performance. For example, Volkswagen’s emission’s scandal in 2015 cost the company $7 billion to cover the costs and more than $4 billion in penalties. Besides, the company’s stock experienced dramatic declines throughout the scandal. Nevertheless, environmental, social, and governance criteria are very subjective and accurate assessment of the factors can be extremely challenging. The environmental factor is primarily concerned with the company’s influence on the environment and its ability to mitigate various risks that could harm the environment. Generally, a company is assessed by its use of energy, waste generation, level of the pollution produced, utilization of the resources, and treatment of animals. The company’s environmental policies and its ability to mitigate the environmental risks may directly influence its financial performance. More governments around the world introduce strict environmental policies and the company’s inability to comply with the standards may result in significant penalties. In addition, the company’s irresponsible environmental policy may damage the areas of the operations and subsequently limit the company’s operational capacity. The social factor investigates the company’s relationships with other businesses and communities. Social factor considers the attitudes towards diversity, human rights, and consumer protection. The social factor may affect the company’s operational success by attracting new customers and retaining their loyalty, and maintaining relationships with business partnersJoint Venture (JV)A joint venture (JV) is a commercial enterprise in which two or more organizations combine their resources to gain a tactical and strategic edge in the market. Companies often enter into a joint venture to pursue specific projects. The JV may be a new project or new core business and communities affected by the company’s operations. Corporate governance is concerned with the internal company’s affairs and the relationships with the main company’s stakeholdersStakeholderIn business, a stakeholder is any individual, group, or party that has an interest in an organization and the outcomes of its actions. Common examples of stakeholders include employees, customers, shareholders, suppliers, communities, and governments. Different stakeholders have different interests, and companies often, including its employees and the shareholders. The proper and transparent corporate governance can help avoid conflicts of interest between the company’s stakeholders, and potentially huge litigation expenses. In addition, corporate governance is directly linked to the company’s long-term success as proper governance policies can help to attract and retain talented employees.